Numbers don’t lie: worldwide, there are over 1.86 billion monthly active Facebook users, with 1.18 billion daily active users – from managers, to students, to small businesses. What does this mean for you? In case you have any doubts, Facebook is too big to ignore. However, simply posting an update on a fan page is not enough. What brands need, especially when starting out, is to create Facebook ads, optimized to reach the right audience. But how to properly run an advertising campaign on this wide social network? 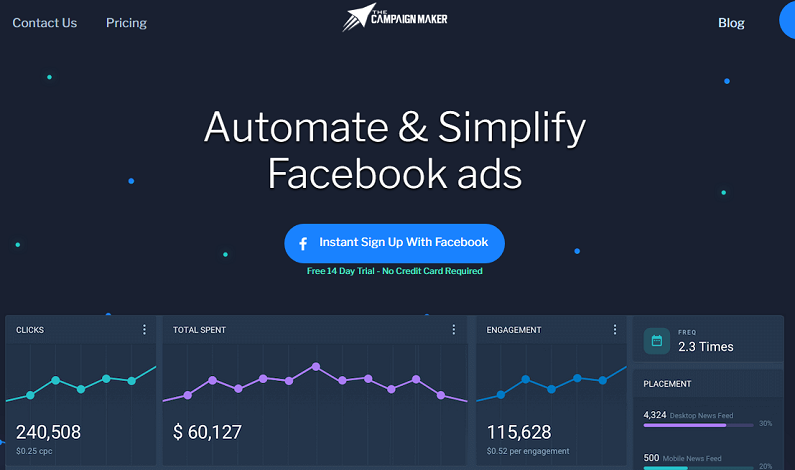 In this post, I’m going to introduce you The Campaign Maker, a platform that will help you optimize, automate and simplify your Facebook ads. Registration is really easy. Just use your Facebook profile to sign up and get a free 14-day trial, with no credit card required. Once you have authorized your account, you will be redirected to the dashboard. Also, you can filter all the data with specific time frames. From here, you can set up a highly targeted optimized campaign in just 5 steps. Let’s see them in details. Then name your campaign and choose the ad account you want associated with it (average time spent on this step is less than 30 seconds). Write your adcopy and set up your ad. A/B test your headline, body text, description, URL and image/video with a simple interface. In addition to split testing, you can also see how each ad will look in both desktop and mobile screens. This is great for beginners (average time spent on this step is less than 5 minutes). Set your target audience with tons of features, like interest, demographic and behaviour suggestion engine. 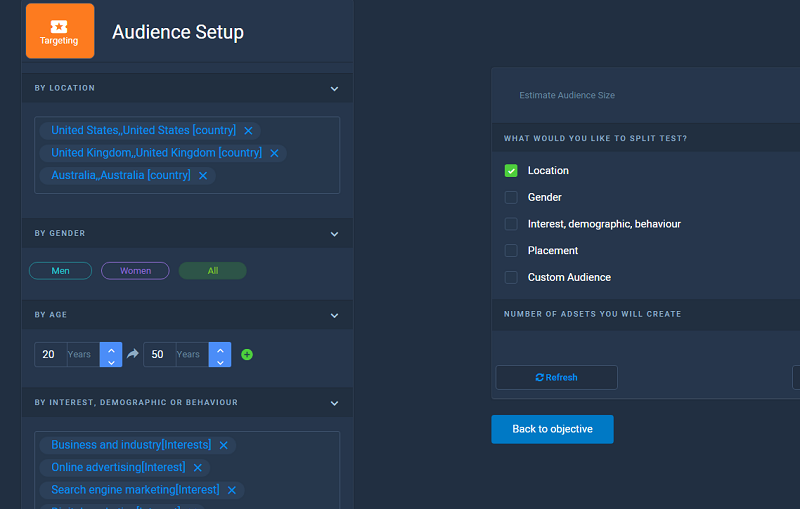 You can also split test every single aspect of your audience all the way from their age to where they work (average time spent on this step is less than 5 minutes). Specify how much you want to spend per day per adset. This is especially helpful if you are split testing a lot of adsets at once. 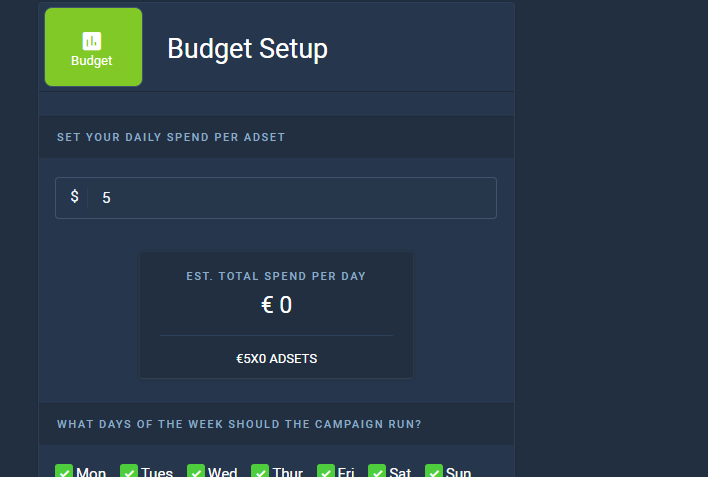 You will also have the option of telling the software at what day of week and time of day it should run the campaign (average time spent on this step is less than 1 minute). The Campaign Maker lays out everything you have done so you can review everything and if you spot a mistake you can easily go back and fix it. Once you finish reviewing it just click publish and let the software do all the hard work! (Average time spent on this step is less than 1 minute). There are lots of more features you can use inside your The Campaign Maker dashboard. For example, you can set new automated rules for your Facebook ad campaigns. Day-Part Your Ads: you can now specify what days and times of the week your campaign should run! Simple Scaling: quickly and easily scale your profitable ads to maximize value. Image & Video Library: upload once and done! All your videos and images are stored securely in your FB’s library. Super Fast Support: The Campaign Maker support staff is available 24/7 for you and can actually help you. Interest Search Engine: as soon as you add just one interest, the campaign maker will generate interests related to exactly what you need. Then you can easily split test between as many interests as you need. Automated Adcopy & Targeting Split Testing: The Campaign Maker automated split tester will at blazing fast speed split test your ads and targeting for you, saving you hours and giving the pin point accuracy your campaign needs. Targeting Intensive: The Campaign Maker is built around creating pin point targeting for your campaigns, with the ability to split test alll the major aspects. Simple To The Point Reporting Structure: the account dashboard is extremely simple and minimalistic, focusing on only the important points that can make or break your campaign. Convenient Budget & Delivery Change: within your account dashboard you have the ability to easily change your daily budget and quickly activate or deactivate your campaign, adset or even ad. Scale profitable campaigns /adsets in one click: the best part of finally making the ultimate campaign is the satisfaction of finally scaling it to maximize your ROI. We made this very easy for you. Mobile Optimized (HTML5): when you don’t have access to a computer, you can access The Campaign Maker from every device you have. 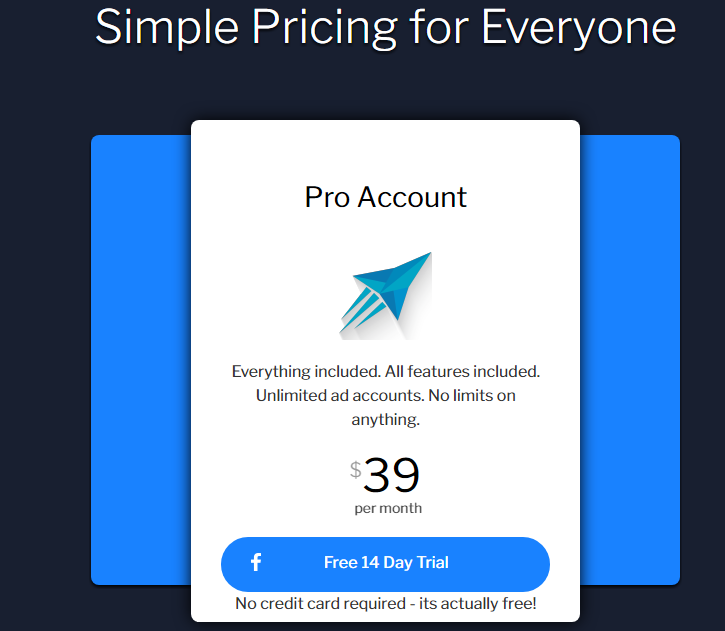 There’s a simple pricing plan for everyone: at $39/mo. Everything is included, with all features mentioned here. Unlimited account and no limits on everything. 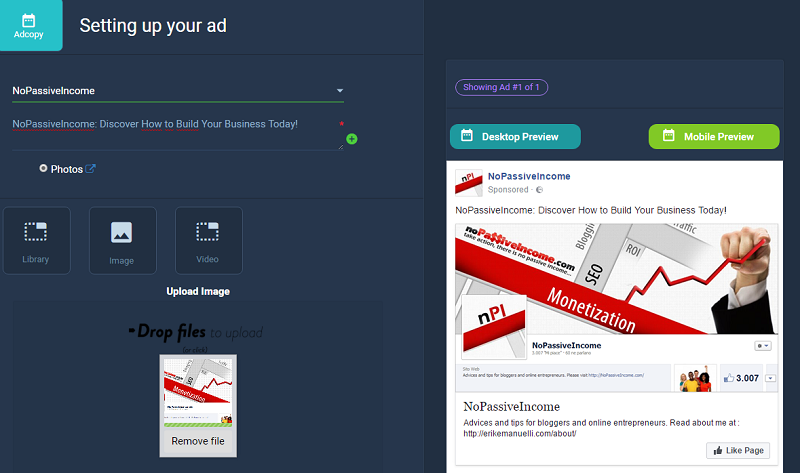 I found The Campaign Maker extremely easy to use, even for beginners Facebook ad users like me. 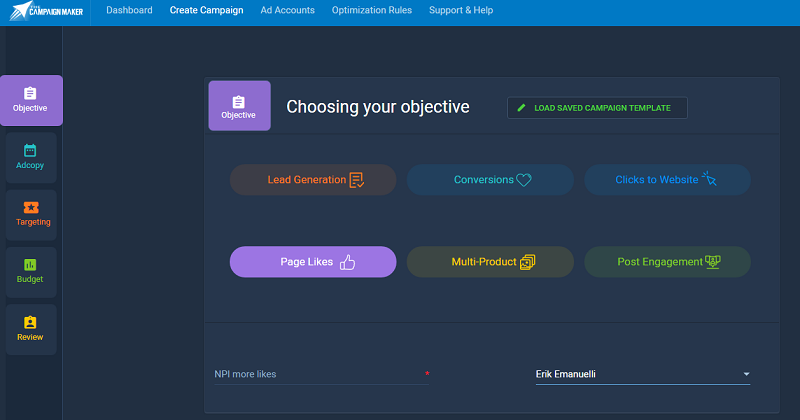 Wasting tons of money in campaigns that end up being no profitable is really common, but with a software like The Campaign Maker you will no longer experience this kind of issue. Other than an affordable pricing, I particularly liked the split testing options, such as placement, behavior, demographic and custom audience. If you need any kind of information, not included in this review, you can contact The Campaign Maker here. Have you ever run a Facebook ad campaign? What was your objective and what about the results? Have you ever heard of The Campaign Maker? Please share your thoughts in the comments below, thanks! I haven’t actually starting using Facebook Ads, but would like to get involved with it later on down the road. I’ve seen some people have huge success with it. This definitely looks great and helpful for anyone who is just getting started with it. I agree, I really don’t want to spend a lot of time or money on a campaign that isn’t profitable. This is one of the things that has kept me from pursuing paid traffic. I don’t want to spend money on things that don’t convert. However, this looks like it might help me be able to get started with Facebook Ads without losing a lot. I think I’m going to give it a closer look, thanks for sharing this with us. FB ads have huge potential. Even with a low budget, you can reach a big portion of audience with related interests. And TheCampaignMaker software may really help to set up profitable advertising campaigns, especially for new users. Amazing tutorial to read, Your article is quite informative about setting up a successful campaign on facebook and managing it, as we can drive traffic insane traffic from facebook. Your article will really help me in running a successful promotion campaign for my blog on facebook. Thanks for the awesome feedback, Gaurav. Thanks for sharing this post. It will really help people like me who are not familiar with facebook ads. This automated process can really help. Glad you liked the post, Vineet. This looks like an amazing software. I haven’t heard of it before. Thanks for telling about its features. I am sure with such huge users our ad campaign thru FB can do wonders. Thanks Erik for this post. A nice and useful review Eric. The social media such Facebook is the most referral traffic sources and where to engage with readers. Facebook, however, updated multi time algorithm so we find difficult to get as many organic reached as before. Thinking of preparing lead page and advertise with Facebook ads is essential bring the business update. Many email marketing software such as Mailchimp, Autoresponse, and so on is now providing manager tool for manipulate the advertising. But some of those are still limited the ability of ads optimization. Again thanks for sharing such an amazing tool. I will take it try as soon as possible. Thank you for that Great information. Thinking of start Facebook lead ads and advertise with Facebook ads for capture more leads.